Does your desktop computer have a beautiful frame of sticky notes? Mine did. But now I work on a laptop, so there's no frame. Crap. So I moved to all my To Do Lists to notebooks. And into the Notes app on my phone. Problem is: I have lists all over the place. And I keep writing and rewriting that list, day after day. I wanted to find a place to consolidate all these lists and to prioritize my tasks and goals for the day, or the week. And I found one I like -- the Goal Getter. There's nothing fancy or pretty about this book, except maybe the cover, but it allows you to prioritize your main goal for the day, as well as 3 top tasks you'd like to complete. And then you have lots of room to write up some "to dos" for the day, and notes below. Whatever doesn't get "done" can move to the next day. I also really like the Daily Affirmation block so I can write something like "You Are Killing It!" or "You're Helping Small Businesses Succeed!". 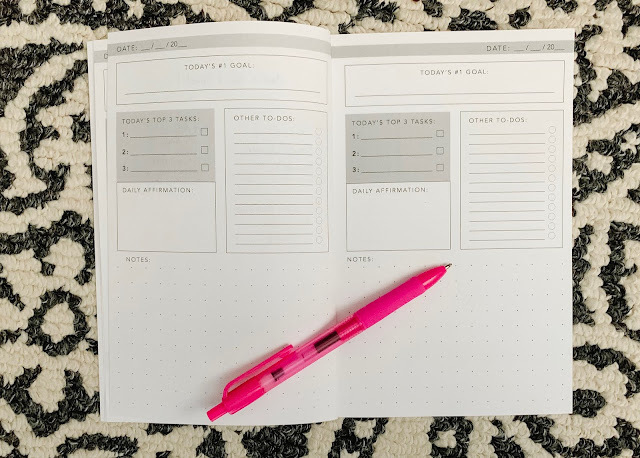 Since I started using this daily journal, I've become more efficient and I'm getting things done! I am able to see what is a "Must Do" for the day, versus other tasks that may distract me. And because I'm a Type A who loves feeling accomplished, I just thrive on seeing those check marks fill the page. The Goal Getter is super affordable, like under $10 on Amazon. You can click the image to go to my affiliate link.